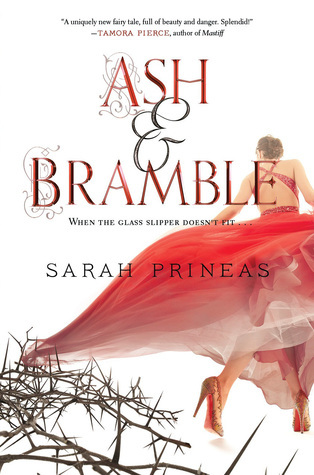 So Ash & Bramble starts off like an old fashion fairytale, dark, haunting and a little odd. I wouldn’t consider this as much of retelling as a reimagining of the old Fairy Tales. As I have said when reviewing retellings before, the original tales are very dark. I thought Ash & Bramble captures this beautifully. I was so completely captivated by this story and really enjoyed it. We have Pin, who is our mysterious main character. She’s tough even though she is working with no memories. She manages to overcome the challenges put before her over and over again. As far as her origins are concerned. We do get pieces that fit together but not necessarily everything. I loved Shoe. He has that perfect personality. He’s a sweet guy but a little rough around the edges. He’s fearful of the Godmother and yet still manages to defy her in small ways by helping Pin. He doesn’t plan to be a hero but his good character just sets him on the path. In all honesty the things he does is because of Pin more than because he’s make righteous choices. The Prince made me laugh because I kept picturing him as Chris Pine in Into the Woods. I guess you could say he was part of a love triangle but not really. Even though Pin/Pen felt drawn to him, her feelings always seemed a little bit distant. I loved how creative the plot was. I don’t want to give too much away because I enjoyed reading it and not knowing anything about it myself. I thought it was a really unique way to incorporate different Fairy Tales. As far as the cover. I really like her shoes. I know weird, when you read the story the cover makes more sense. Especially the fact that her dress is snagging on the brambles. I really liked Ash & Bramble and the way it took Fairy Tales and gives them a new spin. Waiting on Wednesday is a feature hosted by Breaking The Spine where I talk about books that I am eagerly anticipating! This week, my WoW pick is…..
HA. I wish I could see Chris Pine while reading this one! I'm happy you enjoyed this one so much! I was a bit iffy about Pin and Shoe, but the creativity was something else! While I did not like how bare the cover is but i have to agree the plot captures the true dark essence of fairytales perfectly and those shoes are really awesome.